Shipping is important to us. We’re always looking at new ways to get your order to you as quickly and discretely as possible. We strive to ensure that your order is delivered in a timely manner and we understand that privacy is of the utmost importance to you. 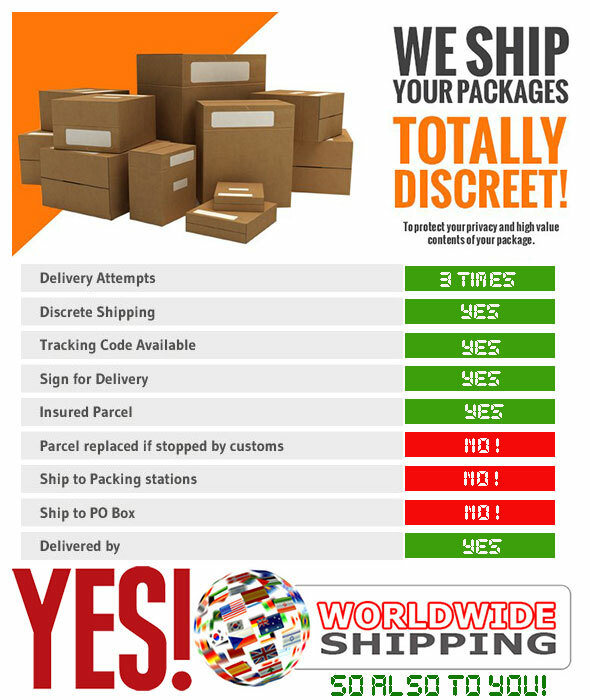 All our packages are sent with 'Track & Trace' and can therefore be tracked online. All paid orders are shipped next business day. After we process your shipment order, we will send your package to the post office/courier company. Then, a tracking number which can be used to track the delivery status of your package will be sent to the email address that is registered with your Shop Account. Once the tracking number is sent to your email address, you can track your shipment. Note: If you don't see the email in your email inbox, please check your spam folder. See the image above! Dont email us, YES we ship world wide. Delivery charges will be indicated during the ordering process. You need to sign in since the costs are automatically set according to the delivery address. When you click on “checkout” in the “shopping cart”, the delivery charge based on the collective weight of the items and the delivery destination will appear in the cart. Rest of the world: 4 - 8 business days. With us you don't have to worry. Only you will know what your parcel contains. All our packaging is completely discreet and will look like the ones on the picture here below. The outside of the package simply has your address, our (return-) address and the necessary postage information on it. Of course we will not use us as sender's name. Your privacy is paramount to us and our discreet packaging guarantees that you are the only one getting excited by the parcel - to others it will look plain boring. Larger items are sent in sturdy cardboard boxes and are double-wrapped with strong packing tape. Smaller items are sent in strong and padded envelopes. All orders are sent in inconspicuous plain packaging. No-one will be able to guess what the package contains or who the sender is. No logo or lettering mentioning our company will be found on the parcel. The only markings on your parcel are your address label on the front and a postal/parcel service sticker, depending on the service used. 1. While we strive to ensure your order is delivered in a timely manner, the customer and/or recipients are responsible for supplying full and correct delivery details at the time of purchase. Should inaccurate details be provided, we cannot be held responsible for any resulting incorrect delivery, delays, non-delivery or charges howsoever incurred. 2. We will not be responsible for any losses incurred by the customer or recipients in non-recoverable carriage and/or importation costs associated with the delivery of any goods or their replacement howsoever caused. 3. In the event of your receiving any faulty or damaged items, please contact us by telephone, letter or email within seven days of receipt of your order. 4. As per stated in our Terms & Conditions, liability is transferred to the customers/recipient once an order leaves our warehouse. Should your parcel be stopped by customs because of its contents, we cannot be held liable.